Ah, that amazing portfolio filled with incredible designs and graphics…in the world of tech recruiting, it’s pretty exciting to land on a designer who has incredible talent and a gorgeous visual portfolio. 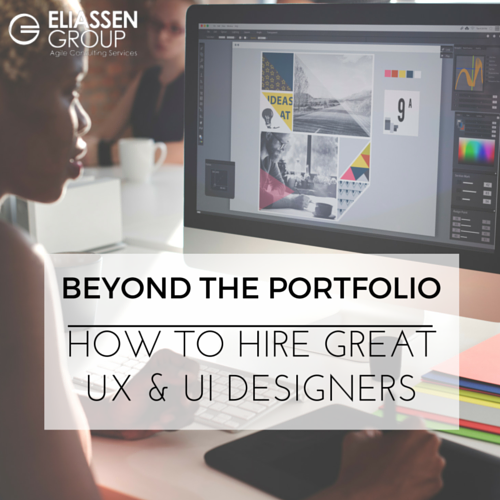 But while shiny, creative portfolios are fantastic to look at and can certainly provide insights into design style, many companies are blinded by this creativity when evaluating potential UX and UI Designers. As we discussed in our recent blog post, Mobile Usability in Web Design: The Demand for UX & UI Designers, it’s no secret that companies that invest in great design consistently outperform their competitors. But when you look at the companies who are doing this incredibly well, you will note that it’s not because they have beautiful, clean websites and materials; rather, it’s because every product, every app, every experience they offer to their users has been carefully conceived by UX and UI Designers who understand the needs of their audiences. As such, the skill sets of strong usability designers must go well beyond the ability to develop amazing graphics. So, as a company hiring manager or recruiter, what should you be considering when evaluating UX/UI Designers? 1) Who are your users? 2) What are they trying to do? 3) What are the constraints they are working under? Companies that seek talented interaction designers must evaluate candidates based upon their ability to analyze these challenges and then apply a user-centered design approach in order to deliver a product that is valuable to their audience. Great user experience designers go the distance to understand human emotions, motivations and beliefs surrounding specific tasks and by designing to support user behaviors, they create effective, satisfying systems that are likely to lead to increased sales and customer loyalty. How do they do this you may ask? Top usability designers employ a sound and repeatable methodology rather than just copying the latest trends – but that’s a topic for our next post so stay tuned! Do you have specific questions about hiring UX and UI Designers? We’d be happy to help – send us an email at: solutions@eliassen.com. Kurt is a Recruiting Team Lead for Creative Services at Eliassen Group. Specializing in the recruitment of Creative professionals. He focuses on User Experience Design and Development of enterprise, B2B, B2C and consumer-facing websites, web applications, digital properties, mobile sites and mobile applications.